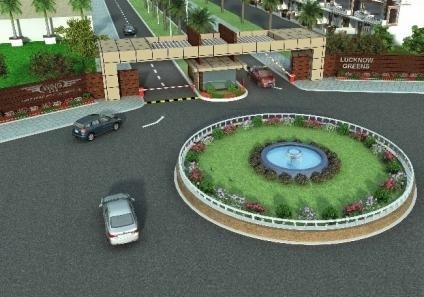 Project name – Lucknow Greens. Company Name- Wing Constructions & Developers Pvt Ltd. Locality – Sultanpur Road Moaizzam nagar, Indira Canal near Ansal API, Lucknow. Plot Size — 2400 sq ft. Build up area — 2100 sq ft. Plot Size — 2152 sq ft. Build up area — 1665 sq ft. Plot Size — 1614 sq ft. Build up area — 1240 sq ft. Plots also available in Block C, D & E.
Plots sizes available from 800 sq.ft. To 3200 sq.ft. 1- Approved by District Board Of Lucknow. 2- Main entrance of 22 meter (72 feet). 3- Well protected by boundary & gates at appropriate location. 6- Land escaped parks with kids play area, Jogging park. 8 -Provision for nursing home. 9- Provision for shopping complex. 10- Land use (143) Changed to Residential. Note :- Home loan Approved by “LICHFL”. Possession will be provide in 30 months. Other Charges if applicable will charge extra.